Our paper in Nature Communications is here. When I joined the Langer lab as a postdoc in September 2010, the lab started moving from the cramped E25 building to the newly–constructed, modern and spacious Koch Institute. Unable to perform any experiments at that time, I spent lots of time wandering around the MIT campus and looking for interesting seminars. In the afternoon of Oct 26, 2010, the Pfizer-MIT seminar gave by Dr. David MacMillan from Princeton University was one of those that I attended. I happened to know MacMillan’s work in organocatalysts that was a hot topic in polymerization. During his talk, MacMillan shared his discovery of photoredox catalysts,1 which immediately grasped my attention. The chemistry is disarmingly easy, using a household light bulb, and it can achieve previously unattainable results. The method is groundbreaking. At that time I just started a new project of developing a light-triggerable nanoparticle for on-demand drug delivery. Nevertheless, I have long-standing interests in the biodegradable polyesters. As a researcher in the polymer science community, I feel frustrated by many reports of plastic pollutions fluxing from the land to the ocean.2 I keenly look for solutions that allow for replacing the non-degradable polyolefins with biodegradable polymers such as polyester. Some polyesters are FDA-approved, often used in biomedical research, as they can degrade to benign small-molecules in bodies. However, many polyesters cannot match the properties of conventional plastics, due in part to the limited chemical structures. When I walked out of building 54 after MacMillan’s seminar, I knew I was onto something pretty stimulating. I conceived an ambiguous idea that combines photoredox catalysts with a versatile type of monomers—O-carboxyanhydrides—derived from 20 natural amino acids to synthesize polyesters, which can potentially expand the toolbox of degradable polyesters to meet different needs. The acceptance of our first manuscript is accompanied with unfavorable comments from reviewers. We were not discouraged but remained ambitious to address the stereoselectivity problem in our new photoredox polymerization. The microstructure (or tacticity) of the polymer, controlled by the synthetic methods, affect the polymer’s thermal and mechanical properties. A stereoregular polymer can have higher melting point and better crystallinity compared with its stereo-irregular counterpart. About 60 years ago, Ziegler and Natta developed catalysts for stereoregular polyolefin production, which won them the Nobel Prize. We have thus set our mind to develop a stereoselective catalyst for our photoredox polymerization. Figure 1. 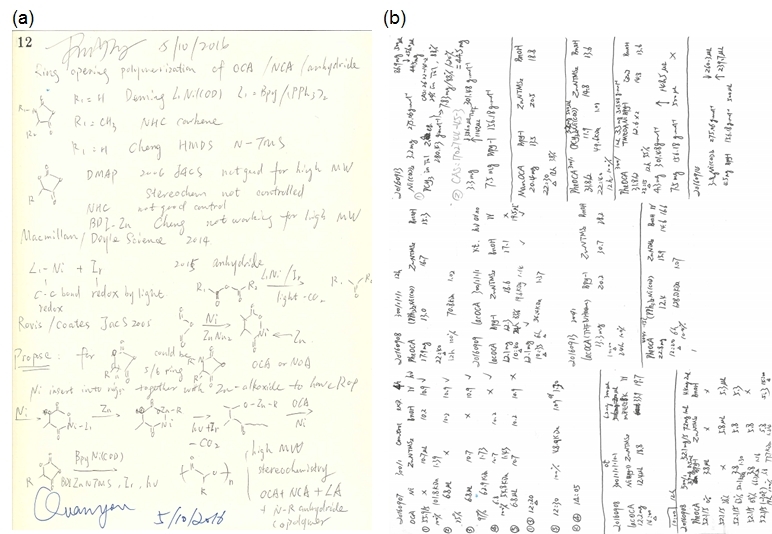 Written notes about (a) synthetic strategy of photoredox ring-opening polymerization, and (b) experiments of optimizing the reaction conditions. After two months relentless work, Quanyou first found out a Zn complex that showed the sign of the stereoselective photoredox polymerization of racemic monomers in NMR spectra. However, the elucidation of the corresponding microstructure was demanding as there were three possibilities, and no literature clearly suggested any solution. I made up my mind that we must do our best to confront this arduous task. We then prepared one deuterated enantiomer to differentiate from the other, while squeezing money from my start-up funds. We persisted and eventually figured out the stereoblock microstructure of our polymers. Our obtained high-molecular-weight stereoblock polymer showed improved thermal properties with distinctive melting temperature compared with the stereo-irregular ones, a sure sign for the success of our stereoselective photoredox polymerization. Two days before receiving the manuscript acceptance notice, I was presenting the work in the 2018 spring ACS conference at New Orleans. Awkwardly, I found that I was the only one working in biodegradable polymer in the whole session, away from the mainstream of polymer society. Stepping out of the conference site, I recalled the advice from my postdoc mentor Bob Langer about choosing future projects before I left MIT for Virginia Tech, “…follow your heart and do good science…in the end, better to have humane conscience behind the project”. I then re-watched the BBC video about “sea of plastic” in my hotel room,5 musing about what I can do to make degradable and environment-friendly plastics. There are bound to be numerous ways. The acceptance of our manuscript by Nature Communications rewards us to make efforts towards the make of degradable plastics. It will not be easy but the joy is always in the doing on the right track. Nicewicz DA, MacMillan DWC. Merging photoredox catalysis with organocatalysis: The direct asymmetric alkylation of aldehydes. Science 322, 77-80 (2008). Jambeck JR, et al. Plastic waste inputs from land into the ocean. Science 347, 768-771 (2015). Zuo ZW, Ahneman DT, Chu LL, Terrett JA, Doyle AG, MacMillan DWC. Merging photoredox with nickel catalysis: Coupling of alpha-carboxyl sp(3)-carbons with aryl halides. Science 345, 437-440 (2014). Feng Q, Tong R. Controlled Photoredox Ring-Opening Polymerization of O-Carboxyanhydrides. J. Am. Chem. Soc. 139, 6177-6182 (2017).